Scientific problems have been traditionally solved with powerful clusters of homogeneous CPUs connected in a variety of network topologies. However, the number of supercomputers that employ accelerators has steadily been on the rise. The latest Top500 list released at SC ‘15 shows that the number of supercomputers that employ accelerators has risen to 109. However, one might argue that low-level wrapper libraries do not in any manner increase programmer productivity as they involve working with obscure function interfaces. In such a case, it would be ideal to have a clean array interface for arrays on the GPU with a convenient standard library that operates on these arrays. Each operation would in turn be tuned with regards to the device in question to achieve great performance. The folks over at ArrayFire have put together a high quality open source library to work on scientific problems with GPUs. ArrayFire.jl is a set of Julia bindings to the library. It is designed to mimic the Julia standard library in its versatility and ease of use, providing an easy-yet-powerful array interface that points to locations on GPU memory. Julia’s multiple dispatch and generic programming capabilities make it possible for users to write natural mathematical code and transparently leverage GPUs for performance.This is done by defining a type AFArray as a subtype of AbstractArray. AFArray now acts as an interface to an array on device memory. A set of functions are imported from Base Julia and are dispatched across the new AFArray type. Thus users may be able to write code in Julia that runs on the CPU and port it to run on the GPU with very few code changes. In addition to functions that mimic Julia’s standard library, ArrayFire.jl provides powerful functions in image processing and computer vision, amongst others. The benefits of accelerated code can be seen in real world applications. Consider the following image segmentation demo on satellite footage of the Hurricane Katrina. Image segmentation is an important step in weather forecasting, and should be performed on many high definition images on a daily basis. In such a use-case, interactive GPU programming would allow the applications designer to leverage powerful graphics processing on the GPU with little or no code changes from his original prototype. The application used the K-means algorithm which can easily be expressed in Julia and accelerated by ArrayFire.jl. It initializes some random clusters and then reassigns the clusters according to Manhattan distances. ArrayFire.jl also has the added advantage that it can switch backends at runtime, which allows a user to choose the appropriate backend according to hardware availability. 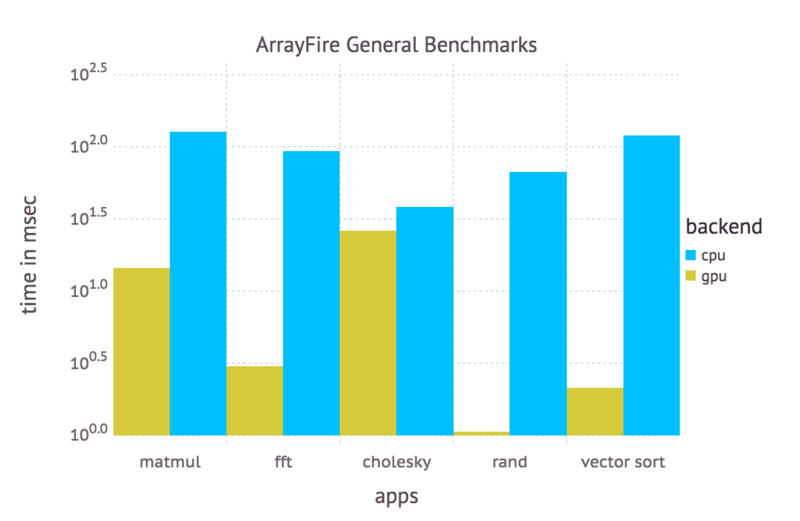 Allowing ArrayFire.jl users to easily interface with other packages in the JuliaGPU ecosystem would allow them access to accelerated and possibly more memory-efficient kernels (for signal processing or deep learning, for example). Currently, only dense linear algebra is supported. It would be worthwhile to wrap sparse linear algebra libraries and interface with them seamlessly.